Pack size: 3 x 240ml solution bottles & 3 contact lens cases. Carefully formulated to store, clean, rinse and disinfect soft contact lenses, Renu MPS Multi-Purpose Solution is a great choice for sensitive eyes. This product is too big for letterbox-friendly delivery, but the Everclear Flat Pack Multi-Purpose Solution (3 Pack) will fit through your letterbox easily and has received an overall 5-star rating from our customers! Review Renu MPS Multi-Purpose Solution Best product on the market. Nothing comes close to this. Review Renu MPS Multi-Purpose Solution Very easy to use and reasonably priced. Review Renu MPS Multi-Purpose Solution Good solution, better than other solutions out there. Review Renu MPS Multi-Purpose Solution Good solution, value for money, not that expensive. Review Renu MPS Multi-Purpose Solution Good solution. Cleans well. Keeps lenses fresh for a whole month. Review Renu MPS Multi-Purpose Solution Not a lot to say. This solution has worked well for me for many years. Review Renu MPS Multi-Purpose Solution Very happy with the product. Have been using it for years. Review Renu MPS Multi-Purpose Solution It is really nice and worthy the price. Review Renu MPS Multi-Purpose Solution Good deal. Review Renu MPS Multi-Purpose Solution good! Review Renu MPS Multi-Purpose Solution Great product. No stinging. Review Renu MPS Multi-Purpose Solution Cant go wrong with these, will always rely on this solution and at a great price on this website. Review Renu MPS Multi-Purpose Solution I use it for my Air Optix Aqua lenses. It works perfectly well. Renu MPS Multi-Purpose Solution Easy to use, good price and quality. Renu MPS Multi-Purpose Solution Good quality and great value for money. I have used this solution for a few months now and love the results. Review Renu MPS Multi-Purpose Solution Fabulously priced and good quality product. Three bottles for the price of one in my local supermarket. Easy to use with no adverse effects. Review Renu MPS Multi-Purpose Solution No problems with this solution and liking the lenses cases included :0) super service from Vision Direct!! Best solution for lenses I tried most of them as they came out, all in a bid to find the cheapest that would work well. I figured out that sometimes you do get what you pay for, and ReNu is worth the cost. No film left on lenses, no nasty burn, and only one solution. Nice. Great solution Always used it,lens feel very smooth and clean afterwards. good product Like size of bottle and screw top for taking on holiday. Have previously used Alcon Opti Fee and Amo Complete but prefer this solution, bottle size etc. Easy to use Product is very easy to use. I just store my monthly disposable lens in the solution each night. No additional cleaning or care required and the lens are comfortable and feel fresh every morning. Simple Simple and straight forward to use, no messing about with different solutions as this is an all in one. Do think sometimes though it doesn't clean as well as a cleaner. Always open to suggestions on other solutions. 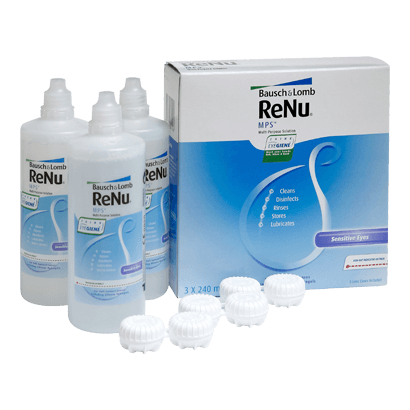 Renu MPS Multi-Purpose Solution is carefully formulated to store, clean, rinse and disinfect soft contact lenses, making it a fantastic choice for sensitive eyes. Manufactured by Bausch and Lomb, one of the world's largest suppliers of soft contact lens and lens care products, this all-in-one contact lens solution is as gentle as your naturally occurring tears. Proven to effectively destroy germs and cleanse your soft contact lenses, Renu MPS Multi-Purpose Solution is extremely good in removing the harmful debris, protein deposits and other impurities after everyday use. Once all those unwanted substances that form on the surface of the lenses are removed, your contact lenses will be suitable and ready for the wearing schedule as prescribed by your optician. Besides removing germs, this solution takes gentle care of both your lenses and eyes, offering a healthy and comfortable lens wearing experience. In fact, the efficacy of Renu MPS Multi-Purpose Solution ensures that even those who have sensitive eyes don't feel like they are wearing contact lenses. With three 240 ml bottles, you can easily use this effective lens solution daily for up to 3 months. But remember you should never reuse the solution. Always use fresh solution for optimum results. The Renu MPS Multi-Purpose Solution is now available in a handy travel pack, making it an ideal pick for those who are planning for that business trip or holiday.